Cat's Stuff: Fun Stuff ... Happy Pi Day! 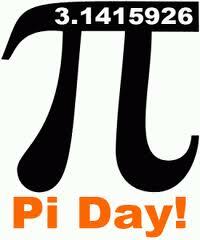 Being a true math geek, I just wanted to wish everyone a very happy Pi Day!! If you are looking for something to occupy your brain on this holiest of math holidays, head on over to brainfreezepuzzles.com for a Pi Day Sudoku puzzle. NOTE: As of 10:00 this morning, Brianfreeze Puzzles had not posted a 2012 Sudoku puzzle, but I will keep looking throughout the day and post if anything changes. The link for the 2011 Pi Day puzzle is still there though, so have fun! Hi Nikki! I am so looking forward to 2015!